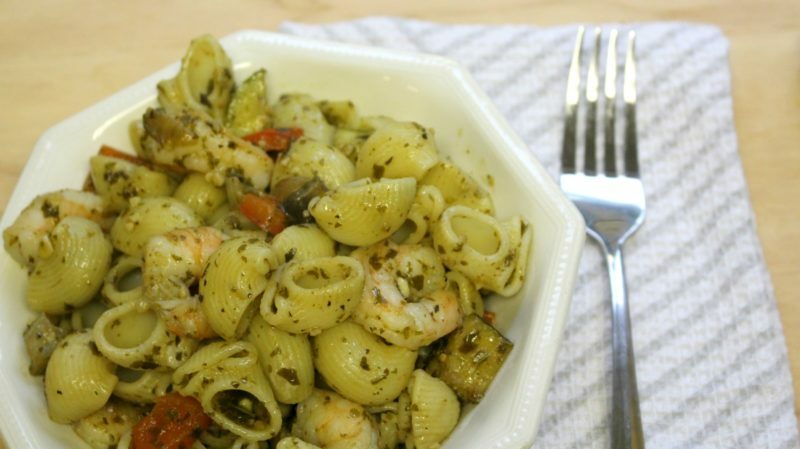 This 30 minute prawn pesto pasta is the bomb! I’ve made different variations of it for years and it’s become not only Matt’s favourite dinner but now it’s Logan’s favourite dinner too! It’s loaded with veggies, and super easy to prepare, making it perfect for weeknight dinners! The first step is to prepare all of those veggies if you haven’t already, but you can save even more time by preparing all of your veggies at the beginning of the week using my food prep guide. You also need to defrost the prawns, but thankfully they defrost super quick using some room temperature water. Just remember to keep replacing the water in the bag as the prawns defrost and the water turns ice cold. Next, saute the veggies starting with the onions, then adding in the rest. Once the veggies are good you add in the prawns and fry for another couple of minutes until cooked through. Then you add the veggie mixture into the pot with the cooked pasta, add the pesto, stir well, and you’re ready to serve this super tasty 30 minute prawn pesto pasta. You can easily swap out the prawns for chicken if you’re not much of a shellfish person. You could also sub the pesto for alfredo, although I think the pesto totally makes it! This is a great weeknight dinner that you can make with your family's favourite pasta noodle. It's loaded with veggies and sure to please everyone. If you're not big prawn fans you can sub for chicken. Boil water and begin to defrost prawns by filling bag with room temperature water. Change water as prawns defrost and water turns ice cold. Heat oil in a pan on medium heat. Fry onions for 5 minutes. Add minced garlic and fry for an additional minute. Add 2 tbsp of pesto, mushrooms, red pepper and zucchini. Fry until cooked, approximately 8 minutes. Add thawed prawns and fry until cooked through, approximately 3 minutes. Add vegetable and prawn mixture to cooked pasta in a large pot. Mix together with remaining pesto sauce on medium heat. Once thoroughly mixed serve with parmesan or nutritional yeast.